6.5 Creedmoor Military Interest Rumors Continue to come in at a brisk rate from military and financial channels. I’ve been at this for a long time and this story seems to be evidence of a real move by the US military to adopt a more accurate and powerful round than the 5.56 and 7.62 NATO. Army researchers are testing half a dozen ammunition variants in “intermediate calibers,” which falls between the current 7.62 mm and 5.56 mm rounds, to create a new light machine gun and inform the next-generation individual assault rifle/round combo. The weapon designs being tested will be “unconventional,” officials said, and likely not one that is currently commercially available. Maj. Jason Bohannon, lethality branch chief at the Army’s Maneuver Center of Excellence at Fort Benning, Georgia, and Matt Walker, deputy director of the branch and a retired command sergeant major, spoke recently to Army Times about broad efforts in small arms weapons research and development. Multiple active and retired military arms advocates and industry experts have presented papers and data on the alleged “overmatch” that U.S. troops face on the battlefield with their current calibers. The paper drew from soldiers’ experience in Afghanistan firefights. He offered two solutions — a more effective 5.56 mm round, or the “better option” of adopting a caliber in the 6.5 mm to 7 mm range. One case, detailed in the 2010 book “The Gun,” by former Marine and award-winning journalist C.J. Chivers, grabbed national attention during the Vietnam War when Marine 1st Lt. Michael Chervenak wrote an open letter that recounted his company’s experiences with the new rifle jamming in combat. “Right now the [M16/M4] platform we have is a workhorse and very effective in the hands of a trained soldier or Marine,” he said. “Our next investment will likely be in a new operating platform,” Bohannon said. At the 2016 National Defense Industrial Association Armament Systems Forum, retired Brig. Gen. Dave Grange and Jim Schatz, an Army veteran and weapons expert who has since passed away, each gave presentations calling for a new “intermediate caliber” in the 6.5 mm range. U.S. Special Operations Command is currently testing a new commercially available sniper rifle using the .260 Remington and 6.5 mm Creedmoor rounds, which “stay supersonic longer, have less wind drift and better terminal performance than 7.62 mm ammunition,” said Maj. Aron Hauquitz. Textron Systems, a private defense industry company, conducted a caliber study using a specially designed .264 caliber cartridge which they said resulted in “terminal effects greater than 7.62 mm NATO out to 1,200 meters” in both their carbine and machine gun. While SOCOM is looking at immediate fixes and off-the-shelf options, Bohannon said that the Maneuver Center and related entities working on weapons issues for the regular Army “invests in more revolutionary, long-term” solutions. 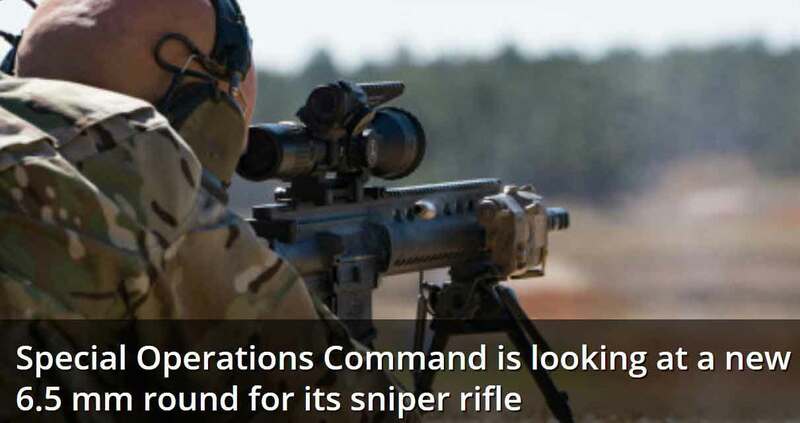 Special Operations Command is exploring a new caliber for its semi-automatic sniper rifle needs and upgrading one of its bolt-action sniper rifle systems. Maj. Aron Hauquitz told Military Times Tuesday that SOCOM is in the preliminary stages of exploring a sniper rifle chambered in the 6.5 mm caliber. The two commercially available rounds being evaluated are the .260 Remington and the 6.5 mm Creedmoor. Hauquitz said that the research is focused on the popularity and availability of the cartridge, and finding out the benefits and drawbacks of the different rounds. At the same time, SOCOM is working to develop polymer ammunition in 6.5 mm to reduce the load for operators, Hauquitz said. Research is showing a one-third weight reduction for 7.62 mm ammunition, allowing the 6.5 mm to come in at 5.56 mm weight ranges. While both the rifle and the ammunition are being developed together, Hauquitz said the polymer portion of the research would not delay potential fielding of a 6.5 mm rifle. He didn’t provide a specific date or timeline for when the new rifle would be in operators’ hands but said they would have a better idea regarding the caliber later this year. Hauquitz said the 6.5 mm exploration came out of preliminary results of the Small Arms Ammunition Configuration study, which evaluates for the military commercially available ammunition, emerging ammunition capabilities, and ammunition technologies for conventional and non-conventional calibers. Last year, the Army chose the smaller Heckler & Koch G28 Compact Semi-Automatic Sniper System for close-quarters fighting to replace the M110 made by Knight’s Armament. Both fire the 7.62 mm round. At the time, H&K received the $44.5 million contract to manufacture up to 3,643 rifles over two years. Meanwhile, the changes SOCOM is seeking for its bolt-action sniper rifle became public earlier this month with a “sources sought” notice. The rifle’s development also involves Marine snipers. The SOCOM contracting office posted the notice for an Advanced Sniper Rifle on the Federal Business Opportunities website on April 6. Industry responses are due on April 24. SOCOM’s current bolt-action rifle is made by Remington Defense, which won the $79.7 million government contract in 2013 after the initial announcement was posted in 2009. Dubbed the Precision Sniper Rifle, it included three quick-change barrels in calibers 7.62 mm NATO, .300 Winchester Magnum and .338 Lapua Magnum for various distance and power needs. Lt. Cmdr. Lara Bollinger, a SOCOM spokeswoman, said Friday that the ASR has “far more refined” requirements and performance specifications than the current PSR sniper rifle. The PSR was designed to replace the three sniper rifles then being used by special ops snipers — the .300 Winchester Magnum MK13, the M40, which shoots 7.62 mm NATO, and the M24, which has separate versions that fire the 7.62 mm NATO and a .338 Lapua Magnum, according to Remington. The recent announcement asks for industry information about a seemingly identical rifle but adaptable for the 7.62 mm NATO, .300 Norma Magnum and .338 Norma Magnum. Firearms experts generally cite the Norma Magnum design as producing a faster and more accurate round. •A light/sound suppressor that can be attached to the system when needed. •A system that includes three caliber conversion kits that can fire the 7.62 mm NATO, .300 Norma Magnum and .338 Norma Magnum. •Not to exceed 17 pounds or a total length, without suppressor, of 50 inches. •A folding or collapsing stock. The 2013 PSR contract requested up to 5,150 PSRs and 4.6 million rounds of ammunition, according to the Remington website. During the development of the PSR, the Marine Corps opted to continue to upgrade the M40 sniper rifle platform, which shoots the 7.62 mm NATO, despite some who argued for the larger caliber .338 as an option. A Marine spokesman said Thursday that they are continuing to make modifications to the M40A6 while also working with the Army and Special Operations Command to develop the Advanced Sniper Rifle. The modifications include an improved, shorter barrel, modular stock and 1.2-pound weight reduction, said Billy Epperson of Marine Corps Combat Development Command. The new barrel increases bullet flight stability, he said. The new stock incorporates a folding adjustable buttstock, and additional accessory rails will support aiming lasers and optics. Each rifle also comes with a new pack, ballistic calculator, weather station and chronograph for muzzle velocity recordings. As the ASR is developed, Epperson said the Marines are “assessing the MK13 as a potential interim solution” to increase sniper teams’ range and lethality. The .300 Winchester Magnum MK13 has a farther range than the 7.62 mm NATO round the M40A6 uses. The MK13 is a rifle that has been used by Army snipers and other units. Regular Army snipers continue to use the bolt-action M2010 Enhanced Sniper Rifle, also produced by Remington. It is chambered in .300 Winchester Magnum.